CHARLESTON, West Virginia, January 27, 2014 (ENS) – West Virginia Governor Earl Ray Tomblin has ordered Freedom Industries to begin the process of dismantling, removing and disposing of all of its above ground storage tanks, associated piping and machinery at its Etowah River Terminal in Charleston by March 15. The Etowah River Terminal, located on the Elk River, is the site of a January 9 chemical spill that leaked the coal-cleaning chemical crude MCHM from a storage tank into the Elk River, polluting the drinking water supply for nearly 300,000 West Virginia residents. Tomblin’s directive is included in a Consent Order issued Friday by the West Virginia Department of Environmental Protection and signed by Freedom Industries. 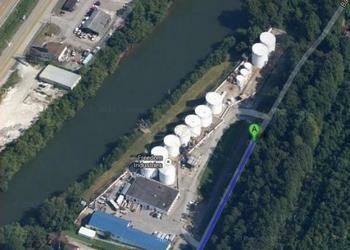 Freedom Industries failed to disclose a second chemical in the leak, state officials said Wednesday. Freedom Industries told the state Department of Environmental Protection on Tuesday, 12 days after the spill, that a second chemical, PPH, was in the ruptured above-ground tank despite an order immediately after the spill to disclose whatever was in it, WVDEP said in a statement. The facility has 17 tanks, including three tanks that contained crude MCHM and PPH. All three of those tanks are now empty. Materials in the remaining 14 tanks include calcium chloride and glycerin. All 17 tanks are located within inadequate secondary containment areas that allowed materials to spill into the Elk River. During the dismantling, Freedom Industries must install measures that ensure that secondary containment is adequate to contain any potential spills resulting from the work. Twenty-four West Virginia scientists sent a public letter Friday to the heads of the U.S. Environmental Protection Agency and Centers for Disease Control and Prevention, calling on the federal agencies to allow scientists to speak freely regarding the Elk River chemical spill. Since the spill, federal and state agencies have released sometimes confusing and contradictory recommendations to the public regarding water safety, the scientists say. “Your agencies have repeatedly failed to adequately respond to questions from the public and the press,” the letter says. “We deserve to be told what is known – and what is not known – about the risks the chemical poses to human health as the disaster unfolds,” the scientists say in their letter. The Center for Science and Democracy at the Union of Concerned Scientists, which organized the letter, says that despite public commitments to transparency and internal policies that generally affirm scientists’ right to speak freely to the press, scientists at both agencies are discouraged or prevented from speaking openly and publicly, especially on high visibility issues. At EPA, for example, reporters are often asked to submit questions to scientists in advance, and public affairs officials approve answers before they are released. The Society of Environmental Journalists and the Society of Professional Journalists also wrote to the CDC and EPA calling for greater access to scientists and officials. “We urge them to adopt specific practices to end press office stonewalling and increase transparency, especially in times of crisis,” the journalists’ organizations wrote. ANCHORAGE, Alaska, January 27, 2014 (ENS) – The Department of the Interior violated the law when it sold offshore oil and gas leases in the Chukchi Sea off the coast of Alaska, the Ninth Circuit Court of Appeals has ruled. The decision came Wednesday in a lawsuit filed by a coalition of 14 Alaska Native and state and national conservation groups. Earthjustice, a nonprofit environmental law organization, represented the groups. The Chukchi Sea is part of America’s Arctic Ocean north of Alaska, a region that is warming at twice the rate of the rest of the world. Inhabited by polar bears, walrus, beluga whales, bowhead whales, and seals, it is also home to Alaska Native communities that have depended for millennia on the ocean for their subsistence way of life. There is presently no oil and gas development in the remote Chukchi Sea. The coast has only four small communities; they are not connected to a road system, lack deep-water harbors, and can only be reached by plane or, in summer, by boat. The region is hundreds of miles from the nearest U.S. Coast Guard station and lacks rescue and oil spill response capacity. The Chukchi Sea lease sale at issue in the case, Sale 193, was originally held in 2008 by the Bush Administration. It offered nearly 30 million acres in the Chukchi Sea for oil drilling – an area larger than the state of Pennsylvania. This is the second time a court has found that the federal government ignored basic legal protections for ocean resources in deciding to open the Chukchi Sea to offshore oil leasing. In 2010 the Federal District Court in Alaska determined that the original lease sale violated the National Environmental Policy Act, because the Department of Interior had failed to address the widely recognized gaps in what is known about species in the Chukchi Sea. It required the agency to reconsider the decision. In October 2011, the Obama administration decided to reaffirm the lease sale. The District Court upheld the Obama administration’s affirmation of the lease sale. This appeal to the Ninth Circuit followed. “The grounding of Shell’s drillship Kulluk showed that Arctic offshore drilling is fraught with dangers that defy rational economic development. Today’s court decision gives a much-needed reprieve to our fragile Arctic waters and the wildlife and people who depend on them,” said Margaret Williams, managing director of WWF’s Arctic Field Program. The Department of the Interior will have to revise or supplement its analysis for the lease sale once again and must reconsider its lease sale decision. The coalition includes: the Native Village of Point Hope, Inupiat Community of the Arctic Slope, Alaska Wilderness League, Center for Biological Diversity, Defenders of Wildlife, National Audubon Society, Natural Resources Defense Council, Northern Alaska Environmental Center, Oceana, Pacific Environment, Resisting Environmental Destruction on Indigenous Lands, or REDOIL, Sierra Club, The Wilderness Society, and World Wildlife Fund. Survey results indicate that with recent weather events and associated power outages, three in four cities have developed plans to keep vital city services operating during sustained outages, and within three years, nearly 90 percent of all cities surveyed expect to have such plans in place. The survey, “Energy Efficiency and Technologies in America’s Cities,” was unveiled during the U.S. Conference of Mayors 82nd Winter Meeting in Washington, at a session with mayors and U.S. Energy Secretary Ernest Moniz at the Capital Hilton. investment for the private sector and the nation,” said Mesa, Arizona Mayor Scott Smith, president of the U.S. Conference of Mayors. Sponsored by Philips Lighting Americas, the survey indicates that mayors plan to make energy-efficient lighting technology, such as LEDs, a top priority over the next two years. LED/energy efficient lighting was rated as the “most promising” technology for reducing city energy use and carbon emissions, said 82 percent of the respondent cities. “Mayors remain optimistic about the energy technology marketplace, with two in three cities anticipating increased investment, whether it is for state-of-the-art lighting or solar energy systems. It is not only cities who have a stake in this success, but the U.S. economy when new industries prosper because of these homegrown efforts,” said USCM Energy Committee Chair Gresham, Oregon Mayor Shane Bemis. Retrofitting public buildings also ranked as a top priority in improving the energy efficiency of city infrastructure. Mayors said they expect to use their own local resources, followed by partnerships with the private sector, as the sources of financing these technologies. The survey found that more than seven in 10 mayors believe their local utilities are now their city’s most important partner in the deployment of new technologies. “This survey provides timely and useful information on how mayors are leading in ways that save taxpayers money, reduce dependency on foreign energy, curb harmful air emissions, and grow jobs, businesses and the economy, said Tom Cochran, U.S. Conference of Mayors CEO and Executive Director. From November 25, 2013 through January 14, 2014, cities could complete the survey electronically, with 288 responses received by the deadline. By email, the Conference contacted nearly 1,400 mayors, most representing cities with a population of 30,000, requesting mayors to compete the survey. More than one in five mayors participated in the survey for a 21 percent response rate. WASHINGTON, DC, January 27, 2014 (ENS) – An investigation by Steve Horn’s DeSmogBlog has revealed that Environmental Resources Management Inc. (ERM Group) – the contractor performing the U.S. State Department’s environmental review for the northern half of TransCanada’s Keystone XL tar sands pipeline – gave the green light to Alaska’s controversial Pebble Mine proposal in June 2013. Like the Pebble Mine review, ERM’s review for the northern half of the U.S.-Canada border-crossing Keystone XL pipeline concluded the pipeline would have negligible environmental impacts. Another thread tying Keystone XL and Pebble Mine together: in both cases, ERM Group’s environmental assessment flew in the face of the U.S. Environmental Protection Agency’s (EPA) assessment. In April 2013, the EPA critiqued ERM Group’s Keystone XL environmental review, while the EPA published a damning environmental review of Pebble Mine on January 15. ERM scolded the EPA for not taking a balanced approach on Pebble Mine, not looking into the “positive effects” it would create if it opens for business. U.S. Sen. Mark Begich (D-AK) didn’t toe the ERM party line, though. “Too many potential long-term impacts to a fishery that is pretty critical to that area but also to Alaska, to world markets. I think it will harm the environment, harm the salmon, harm the jobs that are connected to the fisheries industry out there,” said Begich. Click here for the full DeSmogBlog report. 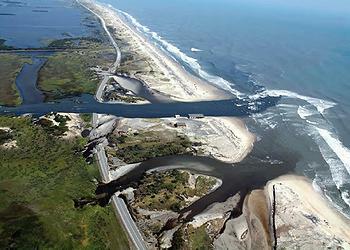 with resulting changes in water flow, increased pollution and habitat fragmentation. In an attempt to reverse these losses Secretary of the Interior Sally Jewell and U.S. Fish and Wildlife Service Director Dan Ashe have awarded $16.5 million in grants to support 21 critical coastal wetland projects in 12 states and Puerto Rico under the National Coastal Grants Wetlands Conservation Grants Program. State and local governments, private landowners, conservation groups and other partners will contribute an additional $18.2 million to these projects, which include acquiring, restoring or enhancing coastal wetlands and adjacent uplands to provide long-term conservation benefits to fish and wildlife and their habitats. Coastal wetlands make up less than 10 percent of U.S. land area yet support 75 percent of migratory birds, nearly 80 percent of fish and shellfish, and about half of all threatened and endangered species. Wetlands in coastal watersheds in the U.S. are experiencing a net annual loss of about 80,160 acres according to a new study by the Service. “As human habitation in coastal areas has increased, population density in the coastal counties has risen to be far greater than that of non-coastal counties,” the report states. States and territories receiving funds are Alabama, Alaska, California, Georgia, Hawaii, Maine, Maryland, Massachusetts, North Carolina, Oregon, Virginia, Washington and the Commonwealth of Puerto Rico. One grant of $464,750 goes to the Alabama Department of Conservation and Natural Resources to acquire the 675-acre Lillian Swamp Wetlands tract as an addition to the Lillian Swamp Wetlands Complex to protect sensitive species and their habitats. These wetlands lie within the Perdido River Coastal Area at the mouth of the Perdido River and border Perdido Bay. The ADCNR has recommended this area as a Geographical Area of Particular Concern, to be managed according to conservation plans. These wetlands are a Gulf Ecological Management Site, considered important to the environmental quality of the Gulf of Mexico. Click here for the complete list of projects funded by the 2014 grant program. The National Coastal Wetlands Conservation Grant Program is administered by the Service and funded under provisions of the 1990 Coastal Wetlands Planning, Protection and Restoration Act. Funding is provided by Sport Fish Restoration Act revenue – money generated from an excise tax on fishing equipment, motorboat and small engine fuels. The Service awards grants of up to $1 million to states based on a national competition, which allows states to determine and address their highest conservation priorities in coastal areas. Since 1992, the Service has awarded $336 million in grants under the program. SAN FRANCISCO, California, January 27, 2014 (ENS) – Indicating how wolves will fare across the lower 48 states if the Obama administration drops federal protections, 2,567 gray wolves have now been killed by hunters and trappers in the six states where wolf protections were eliminated in 2011 and 2012, according to the nonprofit the Center for Biological Diversity. As a result of hunting and trapping seasons in those six states, roughly half the total known population of wolves in the lower 48 in 2013 has been killed, and wolf populations are now in decline. “If this senseless slaughter doesn’t convince the Obama administration we need to reverse course on plans to drop wolf protections, the bloodbath will go on,” said Amaroq Weiss, a wolf advocate at the Center for Biological Diversity. Idaho and Montana have held wolf hunting or trapping seasons since federal protection was removed in 2011. By 2012, Wyoming, Minnesota and Wisconsin had followed suit, and in 2013, Michigan also allowed wolf hunting. So far 912 wolves have been killed in Idaho, 566 in Montana, 130 in Wyoming, 562 in Minnesota, 374 in Wisconsin and 23 in Michigan. These deaths are in addition to wolves that have been killed by agency staff for conflicts with livestock and wolves killed by illegal poaching. Scientists estimate that when Europeans arrived on the North American continent there were as many as two million wolves. As settlers moved west, the livestock industry declined to coexist with wolves, and the animals were all but eliminated in the lower 48 United States. Once the gray wolf was listed under the federal Endangered Species Act, recovery plans were implemented in limited parts of the country. But in those states that have now assumed wolf-management authority, aggressive state-sanctioned hunting and trapping seasons aim to reduce wolf populations to bare minimums. In only two years the northern Rockies wolf population has been reduced by seven percent, and Minnesota’s wolf population has plummeted by 25 percent. In December the state of Idaho allowed a wolf and coyote killing contest to be held by a private party, and that same month, Idaho sent a paid gunman into a designated federal wilderness area to eliminate two whole wolf packs to boost elk numbers for human hunters.